I like how you tweaked this Jeffrey! This is a really neat idea! I like how you decide how much you can save each week as opposed to going in order and saving an extra dollar each week. We all have moments when money is tighter one week to the next and allowing for the flexibility to choose your savings amount increases the likelihood of people sticking to this plan. I like the change in this system, what a great concept Jeffrey! This is a really awesome new spin on helping people save money. Thanks Jeff – let’s try this out. We’re always looking for new ways to save money. I can see how the chart would make a difference if you are only able to start small. You’d see the reward and hopefully, it would encourage you to keep going. I messed up already with the 52 week challenge, but I’ll get back on track. I like how you related this to Yahtzee. I may try that out next year. What a convoluted complicated way to save! Simply know that every $10 you regularly save per week will net you $500 over the course of a year. Set up a regular savings program with your bank where money is redirected to your savings account before you get it. Try $30 a week ( $1500 a year ) If you don’t have it to begin with you won’t miss it. I was sent this on Facebook. What a neat idea! It is very much like a game. This is a feel good way of saving money. I doubled the original 52 week challenge and saved over $2500! This is definitely a fun way to save. I have tried this method for the first time last year, and it really works. You have to stay focused and committed to saving. There maybe a few things to cut out of your spending habits to achieve this, I myself had to cut out two trips to Starbucks I bought a bag of coffee beans to take my own coffee to work, and I began packing my own lunch I also stopped buying bottled water and started refilling and chilling my own water. the system works just need commitment. I did it last year, got up to over 400 and needed new tires. It came in handy for that. Happy holidays! This sounds like a great challenge. I can’t wait to try it out in 2015. Hi, the whole concept is really interesting. I think this could be done with almost any currency in the world, not just US pennies. That means the whole world could join the 365 day money challenge which would be great! I think this challenge looks easy, but really isn’t. $1 for a week anyone can do, but $52 iss a lot for many of us. I’m curious how many actually succeed until the very end. I love the idea of the 52 week challenge! I heard about it from a friend that’s doing it, and I think that I’ll start this month as well. What’s the worst that can happen? I save a few more bucks than I would have otherwise. Thanks for the great idea! Hi there to every one. I too, am on the bandwagon to do the 52 week challenge. It seems like a great way to save money with little effort. I wish everyone participating success, including myself. See you in a year $1000+ richer! I heard about this challenge from a friend and it looks like something I could do. I can’t wait to get started. I don’t think that the 52 Week Savings Challenge will work for most people. It sounds easy. Who can’t save a dollar in one week. Or two dollars. But that last month is brutal. You have Christmas plus you need to save over $200. I don’t think most people who have never been able to save for an emergency fund are going to be able to do that. It’s one of those things that looks good in principle, but won’t work in reality. Just my 2 cents. I think this is a great idea on a way to save money a little at a time over the course of the year. It seems simple to do and easy to succeed. It’s something that I’m willing to give a try at the very least. I haven’t had an emergency fund for over 2 years now, and living paycheck to paycheck causes me a lot of stress. I need a way that can help me build one so can get rid of some of this stress. This looks like a good plan to start. Thank you. I am not a regular reader, but I enjoyed this piece and decided to comment. The 52 week challenge looks like it’s something that anyone could accomplish if they put a little effort into it. 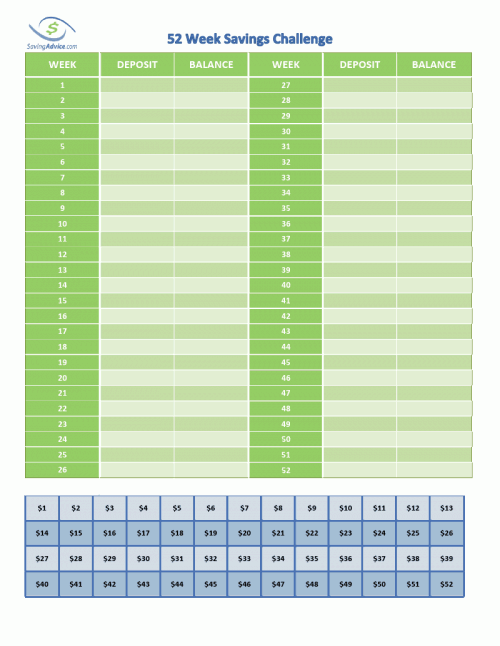 I like the idea of choosing the amount each week rather than starting from $1 and progressing to $52. I think I would stumble doing that, but if I can choose each week, I could knock off some of those bigger numbers early. I think I’ll give it a try. Where’s the best place to keep money for this challenge so that it doesn’t get spent on other things. Should I keep it in a separate bank account or at home in a jar? You should keep it someplace that you won’t accidentally (or purposely) spend it. A separate account would work. An online account would also work. A jar at home would work if you have the discipline not to touch it. The best course of action is to do what will work best for you — you know yourself best, so choose something you know will allow you to save the money each week. Can I start this at any time or do I have to wait until the beginning of the year? I would like to start now, but won’t it get confusing if i start now instead of when the year begins? You can start anytime. It just means that you’ll end the challenge this time next year. 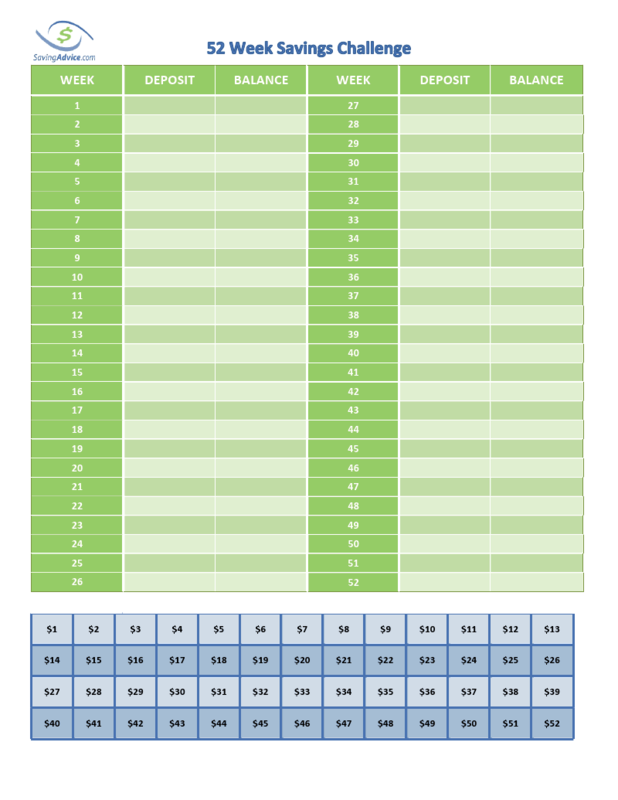 As long as you cross off your numbers each week, there shouldn’t be any confusion where you are in the challenge and what amounts you still need to save. Thanks for the wonderful idea. I love it and I think I can do it. I’m starting next Monday! I’m happy that a friend sent me to this challenge. I think it’s something that I can do and I want to try. A dollar a week isn’t a lot, but it adds up over the year. I think this will help since I have had trouble saving money in the past. Thanks for the great idea! I’m going to try this beginning today! This is a fantastic idea. I can’t wait to give it a try and build my emergency fund. Thanks for the idea! I’ve been looking for a way to start my emergency fund and this may be the perfect way for me to do it. It seems possible, unlike many other things I’ve tried. I’m hopefully optimistic I’ll have over $1000 in it next time this year. Starting this week. I’m in. I’ll update this again very soon to tell everyone how I’m doing. I’m not that much of a online reader, but I’m happy I came across this idea. I was hoping to find something that could help me create an emergency fund, and this seems to be a good fit. I hope I can succeed. Please wish me luck! I’m on board. Thanks for such a creative idea on saving money. How many people have continued with this challenge? It’s August now, so half the year is over. Are people still saving money or have they given up. It sounds easy, but do people really follow through? That’s the real question. Howdy! I think this is a great idea and I can’t wait to try it out. Trying to save an emergency fun is something I have always struggled doing, so I’m hopeful this will be the solution. It seems like a fun and easy way to save. Wish me luck!!! Count me in as another who is going to try this.I need something to motivate me to start an emergency fund and this seems like it will do the trick. Thanks for the idea! I’m in as well. I’m not even going to wait until the beginning of the year. I’m going to start today! I’m not sure why but I don’t think this is such a great idea. How is anyone supposed to save over $200 in December when it’s Christmas. That’s just not possible. I think you need to come up with a better system so i can save money easier. The idea is that you save specific numbers when you can. You don’t have to wait until Christmas to save the bigger numbers. If you know you’re going to be tight in those months, save the higher numbers ($40+) in another part of the year. You don’t have to save in order. Wait until December to save your $1 for instance. Also, you don’t have to start this challenge at the beginning of the year. Nice post. I think everyone could benefit from saving a bit more money and this looks like a creative way to do it. The most important thing is to begin. Even if it’s a small amount, starting will do wonders for your savings in the long run. Make it a habit! So, has anyone actually succeeded in completing this challenge? Thanks for this marvelous posting idea! I’m in! Can’t wait for the new year to start and to put some money into my savings account! I did it in 2015, after 6 months of being unemployed in 2014. Happy to say I was able to save $1500.